Where to sleep during the Shikoku pilgrimage might be a problem : how to book ? how much it will cost ? What is possible or not ? We will try to give you some solutions. 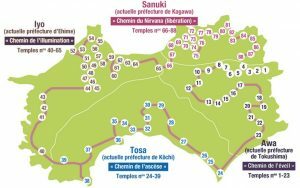 Interactive map of the Shikoku pilgrimage (Henro Michi) presenting the 88 main temples of the pilgrimage. This map provides an overview of the provinces of Shikoku traveled during the pilgrimage (henro michi). Hachiju hachi kasho what’s that? Ryokan, the traditional Japanese inn. Sleeping in a ryokan is an unforgettable experience , encounter with aesthetics and Japanese luxury. The japanese spirit. Henro Goya huts available for Henro ( pilgrims ) all arround the Shikoku pilgrimage. It’s very simple hut, built for rest not to sleep. Zenkonyado (善根宿) is a place to sleep put at disposal of shikoku pilgrims by individuals free of charge or a very slight financial participation. Nojuku ( 野宿), sleeping outdoors is an unforgetable and spiritual experience for walking pilgrims (aruki henro) and so usefull for the real budget traveller.